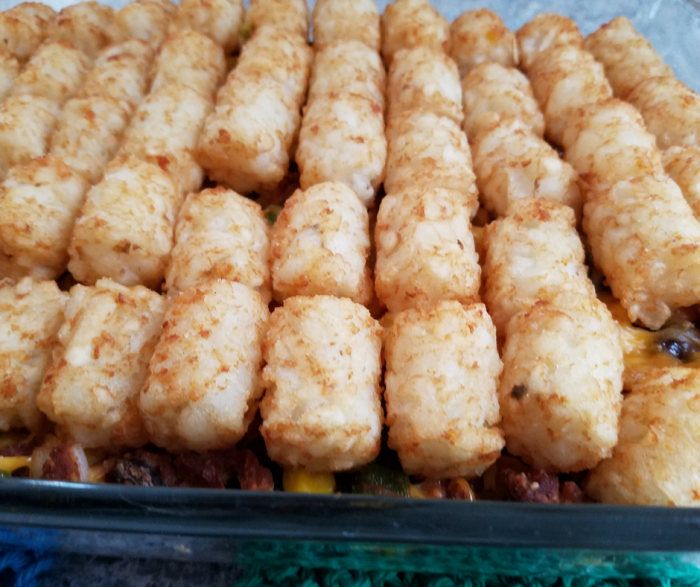 Making a Tater Tot Casserole Recipe used to mean tons of cream soups and church potlucks. 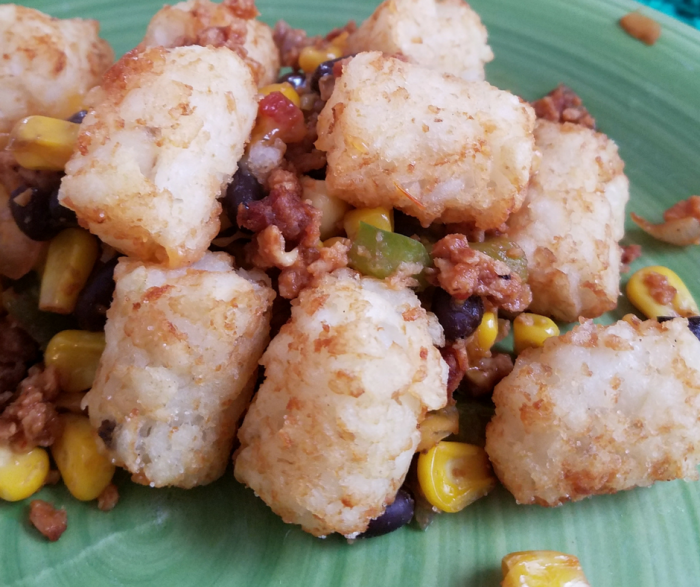 This Mexican Tater Tot Casserole Recipe is a perfect new way to enjoy a classic dish but make it healthier and kid-friendly. It comes together in minutes, and it pleases the entire family. Kids love it, and adults love it. Plus, it is a healthier option you can feel good about feeding to your family. This post includes affiliate links. I earn a commission on purchases made from these links. Confession time. I am a huge fan of these comfort foods from my childhood. They usually aren’t healthy, but they are so delicious! It’s hard not to want to indulge. 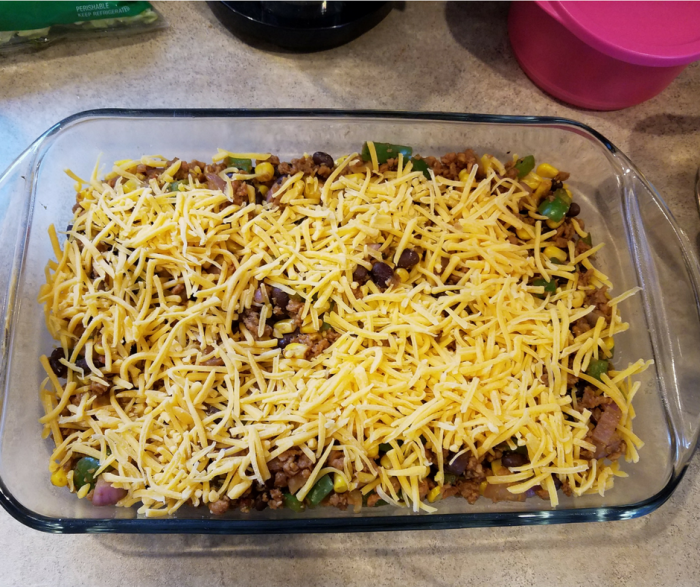 Remaking a tater tot casserole to be healthier, and adding our favorite Mexican flavors, well, that’s just what I needed to do. 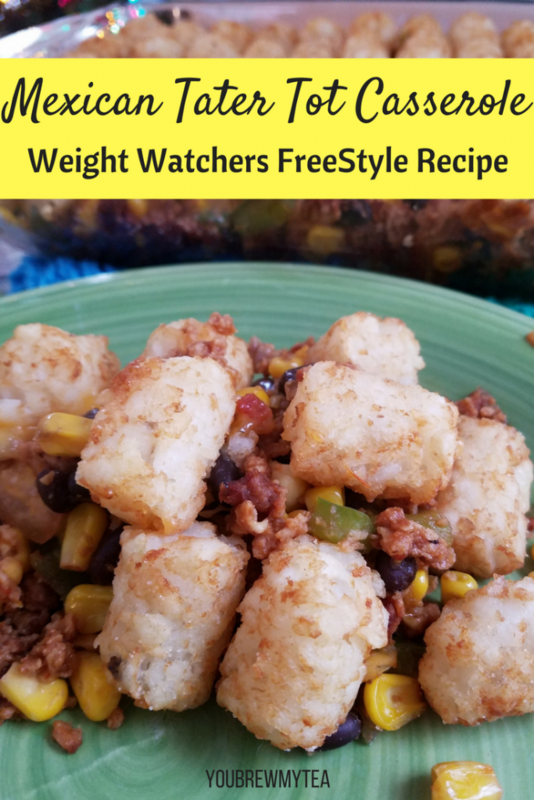 This recipe is an ideal Weight Watchers FreeStyle recipe to make dinner time easy to manage. 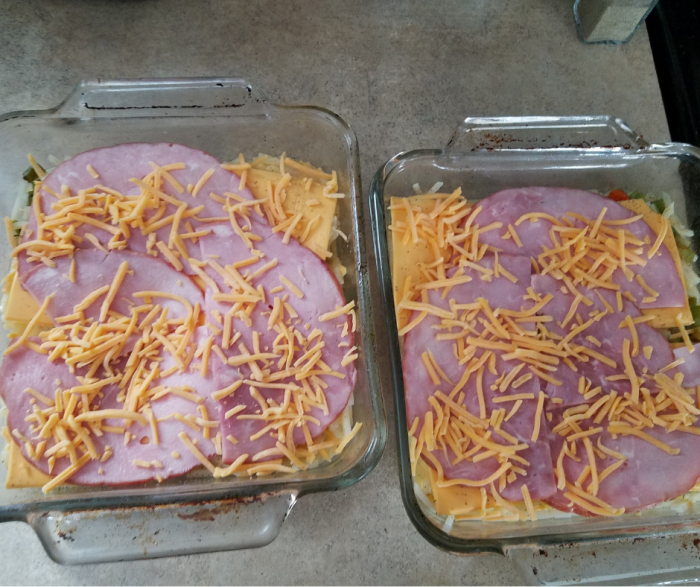 For recipes like this, I use my Pyrex casserole dishes. Some don’t care for them, but they are my favorites and have been handed down to me through the years from my mom and grandma. 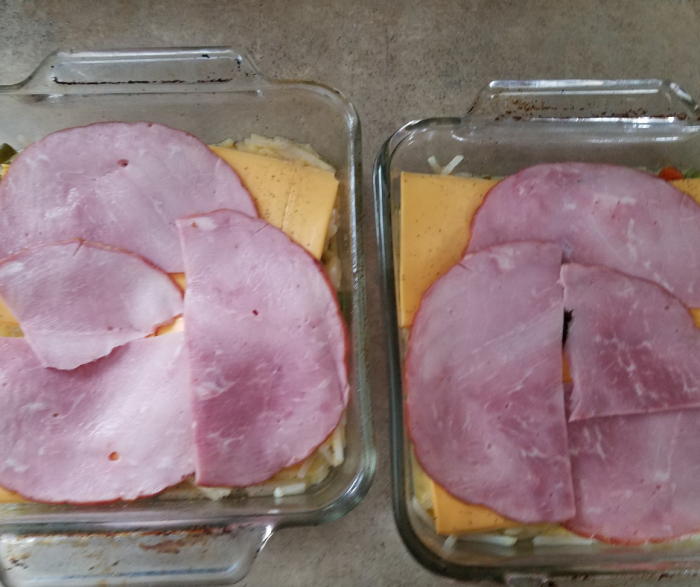 The one I would use for this recipe is the traditional 9″x13″ glass casserole dish. 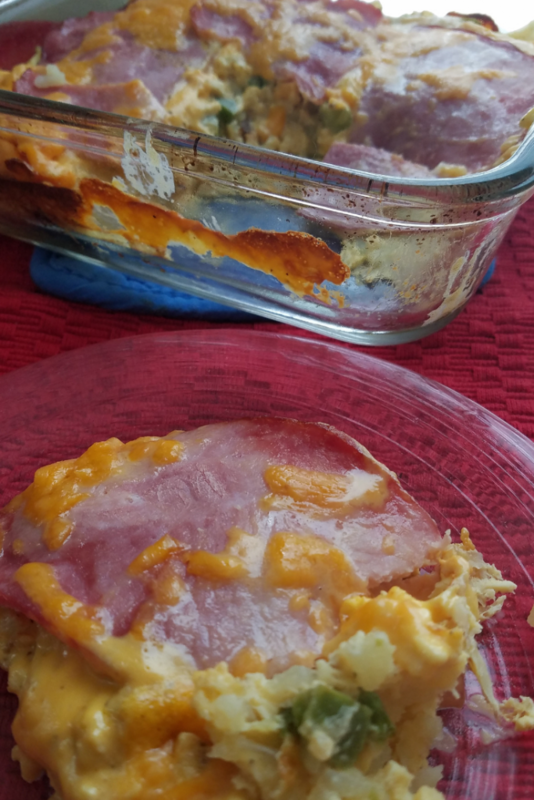 You could easily use any baking dish you prefer, but that is my favorite. In a large nonstick skillet, cook the ground turkey for 5-7 minutes stirring occasionally to prevent sticking. If it begins to stick, you may want to add some fat-free broth or a small amount of nonstick spray to help prevent it from sticking. 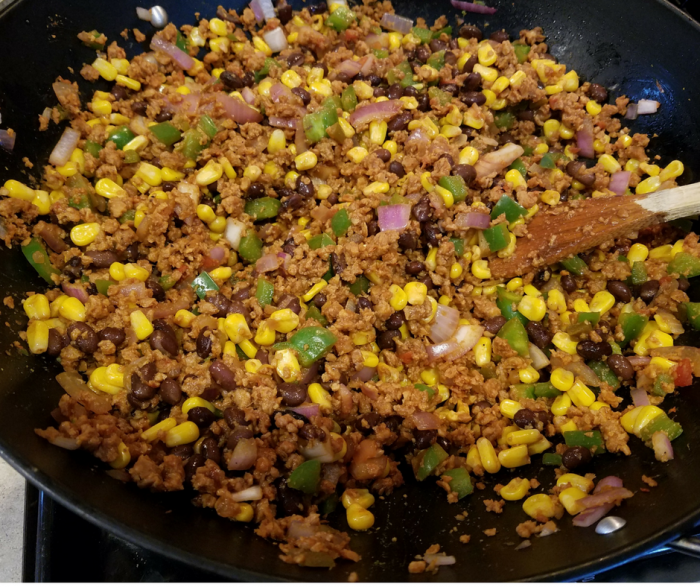 When ground turkey is cooked through, add in black beans, corn, salsa, cumin, onion powder, and garlic powder. Cook for additional 3-4 minutes or until everything is mixed well and heated through. 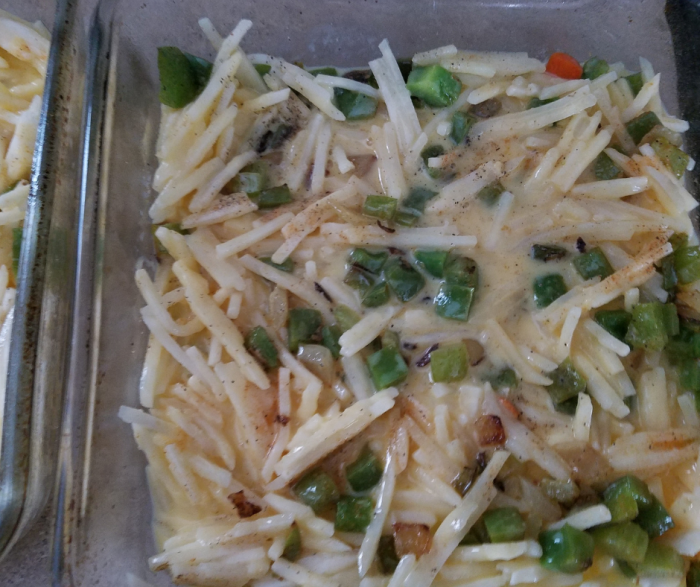 Pour mixture into casserole dish and sprinkle the top with shredded cheese. Layer the tater tots across the top of the mixture and sprinkle lightly with salt and pepper. Bake at 375 degrees for 25 minutes or until heated through and tater tots are crisp. 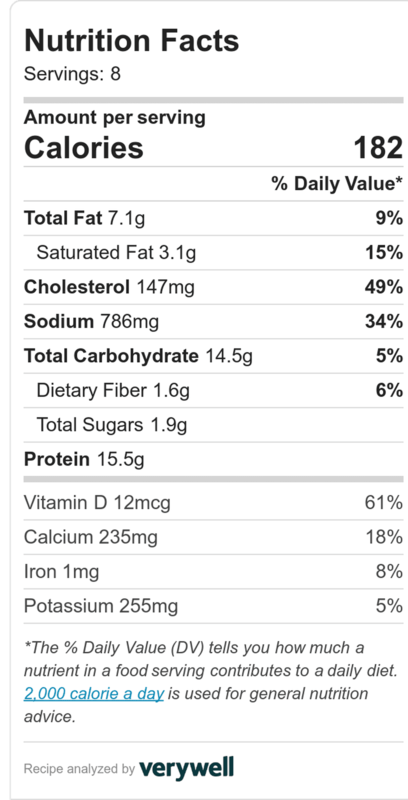 Note: You may want to add salt and pepper to finish, but I typically skip until time to taste as the salsa and canned goods can have extra sodium. 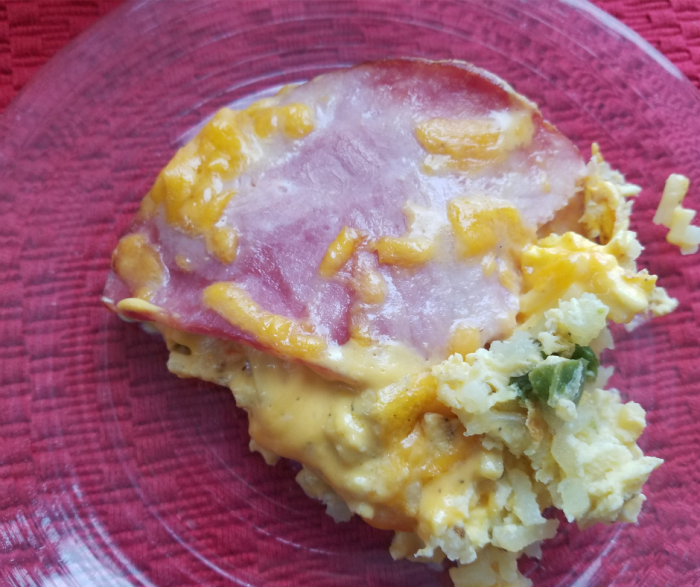 This Weight Watchers FreeStyle recipe is definitely going to be a new favorite for your family. 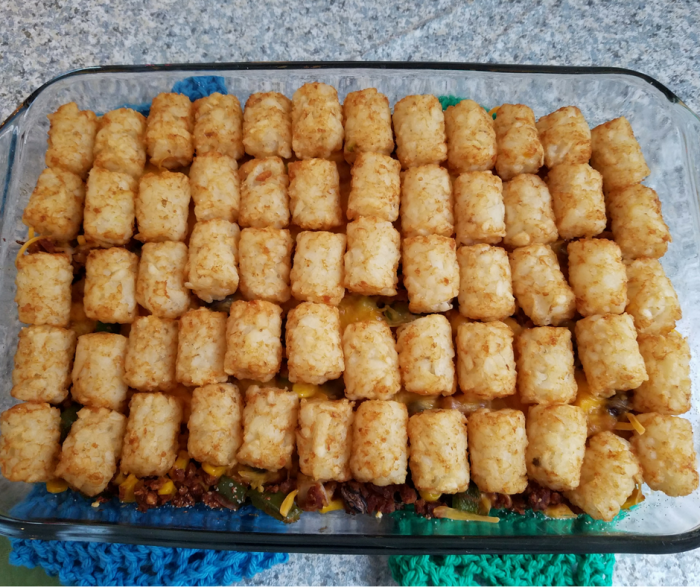 Making any tater tot casserole recipe is a sure fit for family-friendly food, but this one goes the extra mile. You can also easily add some lettuce, tomato, and fat-free sour cream or nonfat yogurt to the top if you prefer. 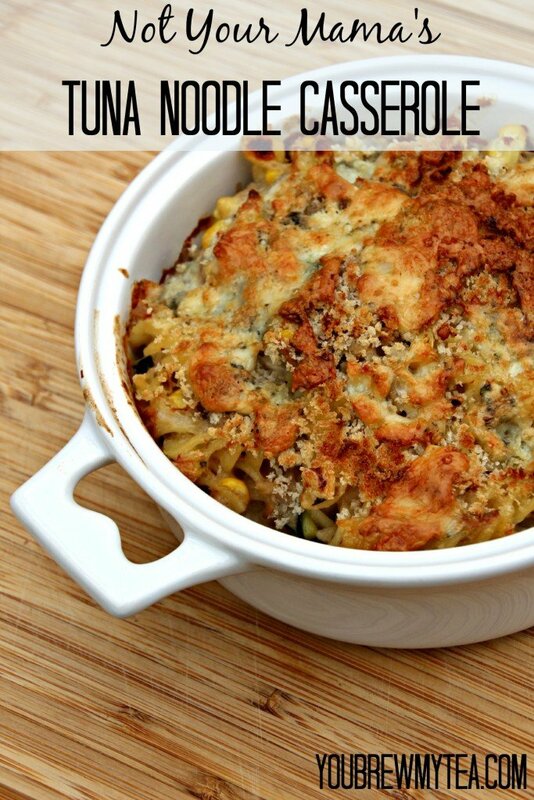 Serve with a large salad on the side for a large and healthy meal the whole family will love. 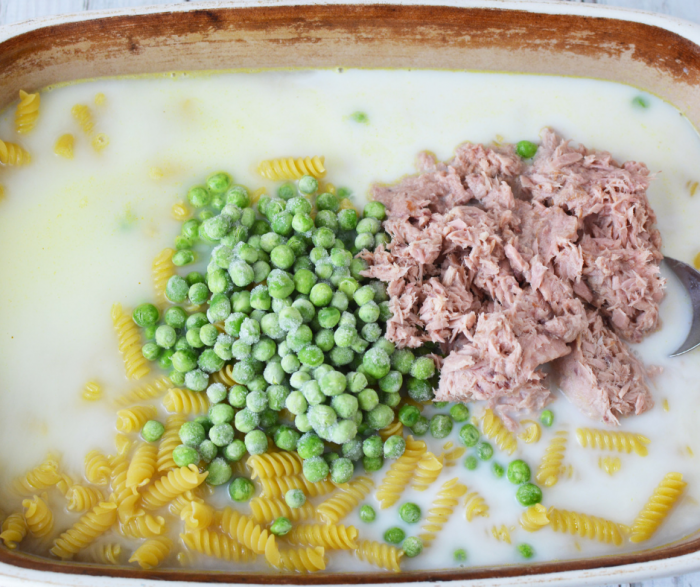 What’s better than tuna casserole? 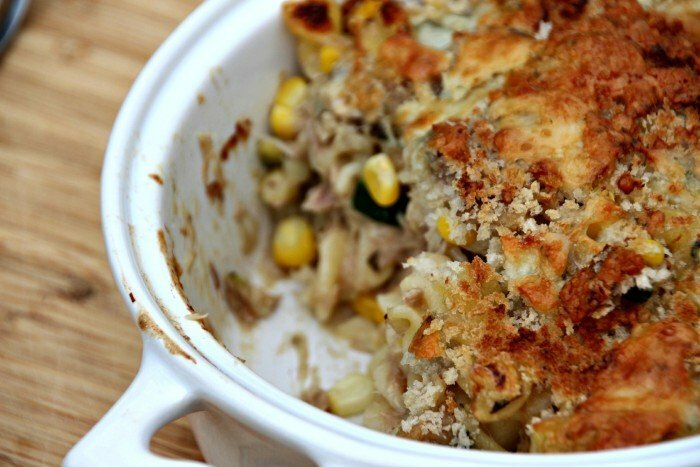 How about tuna casserole with blue cheese, fresh off of the cob sweet corn, Shiitake mushrooms and zucchini? Nothing like shaking things up, right? 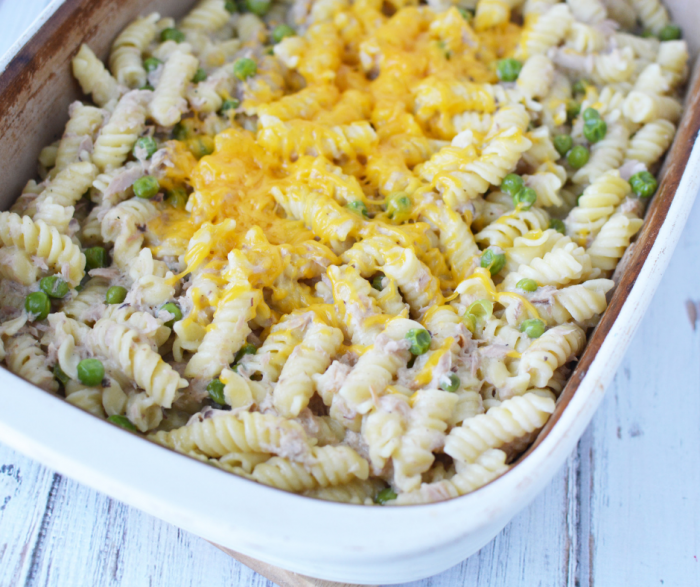 This is definitely not your mama’s tuna noodle casserole, but a wonderful upscale hearty version that is full of incredible flavors for the foodie in you. 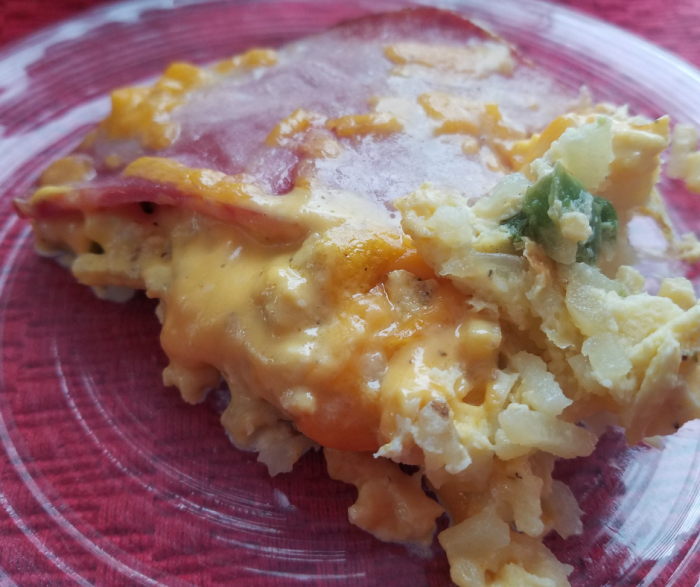 This recipe was prepared by my good friends from over at A Worthey Read and they were nice enough to let me host it here on our site to share with you. Check out D & Tat’s great food, travel adventures and more on their site! 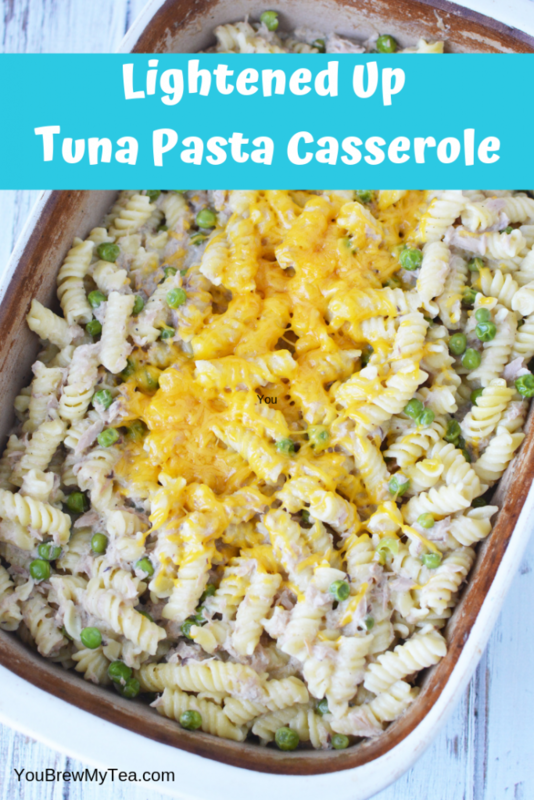 My Beau loves tuna noodle casserole, and since it isn’t something I enjoy I confess I don’t make it very often. When I heard about this great take on it, I was pretty sure it would be something he would love. He also loves mushrooms and blue cheese – a couple of other things that aren’t on my list of faves. So, not only was this a recipe I wanted to share here with you – I knew it would be one I would eventually make at home. 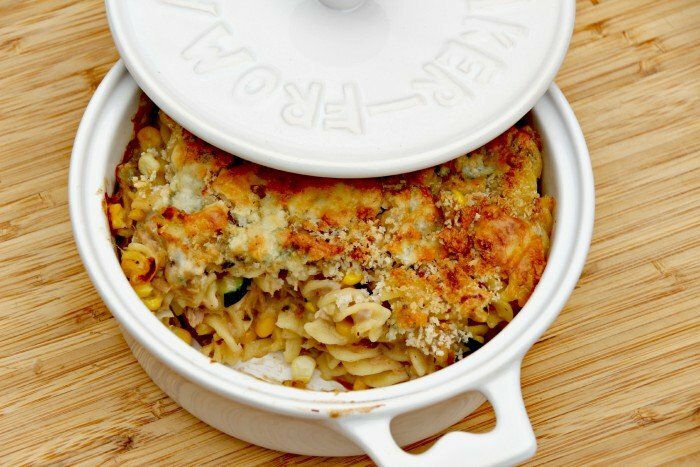 I love how he used shiitake and zucchini to really bump up the hearty veggie flavor in this. If your kids are picky about veggies, this is definitely a direction to go to get them to eat the without fussing. Blue cheese was definitely an addition I never would have considered, but according to those who tested it – it works beautifully! It sure looks delicious! Fill a medium stock pot with water and set on high heat. When water is already boiling empty pasta into pot, add a pinch of salt and a tablespoon of olive oil. Stir. Follow directions on box. After pasta is finished pour off water and rinse with cold water to suspend the cooking process. Set aside. In a non-stick skillet add a tablespoon of unsalted butter or olive oil and sauté vegetables individually. Add veggies to cooked pasta. Add drained tuna and package of Campbell's Creamy Garlic Sauce, add Kosher salt and cracked black pepper to taste, stir. 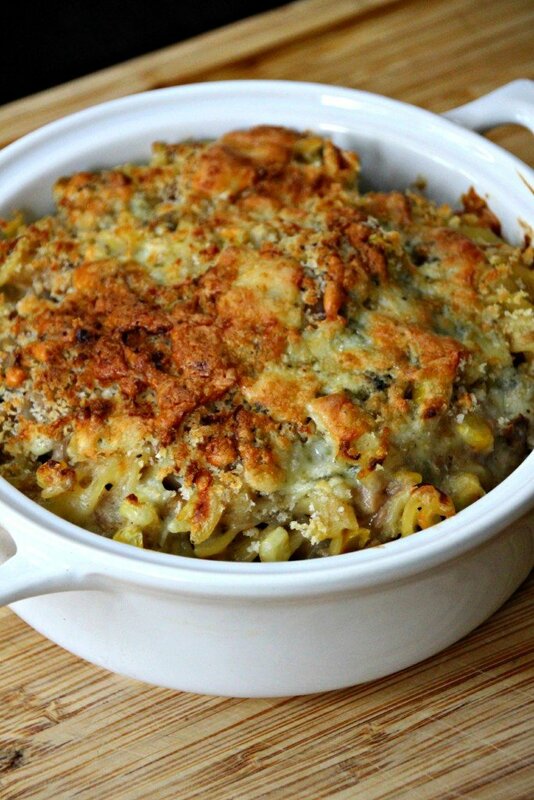 Spoon mixture into casserole and top with Blue Cheese Crumbles and Panko bread crumbs. Place in a pre-heated 350 degree over and bake for 30 minutes. Remove from oven let cool and serve. 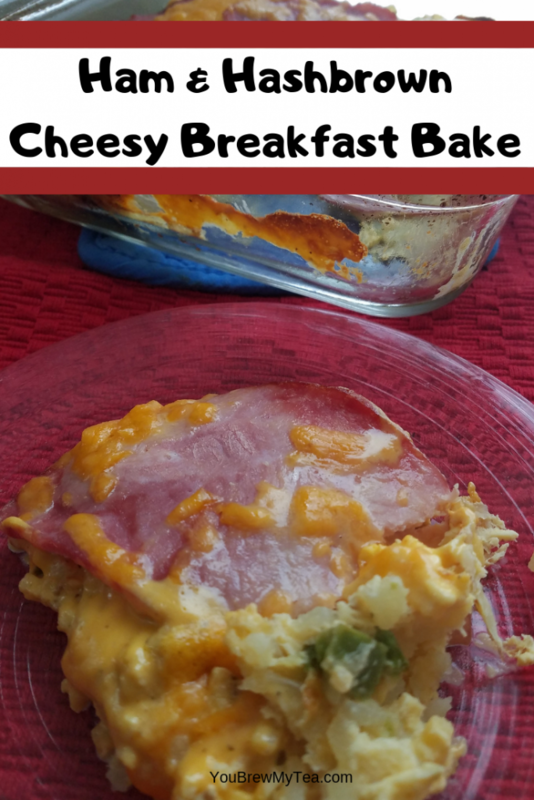 This is a simple, yet wonderful family friendly casserole that everyone will love eating. Choose a few different sides like salads or fresh grilled asparagus, or serve alone since it already has a great amount of vegetables in it. 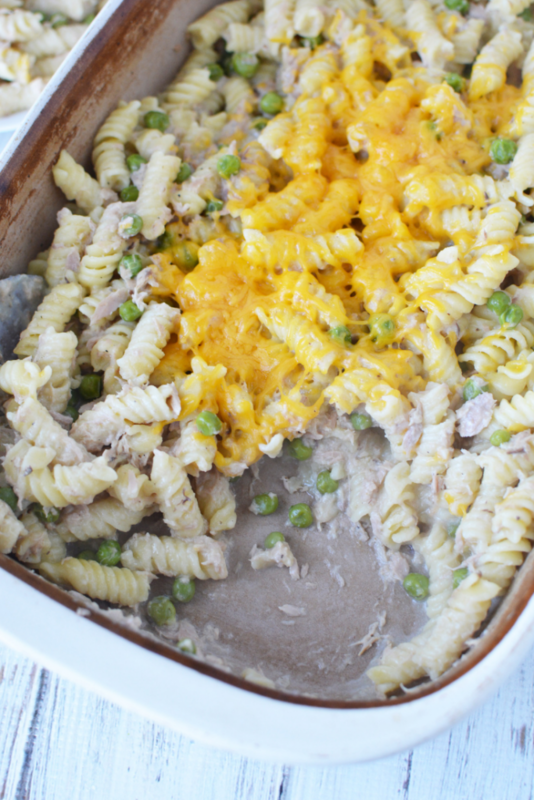 This tuna noodle casserole is one classic dish that is now upscale enough to be a great choice for a special dinner party with friends and family. Check out some of our other favorite family friendly recipes!